Can You Stain Oak Cabinets With Espresso Stain Color? Red oak has a deep, warm hue and is frequently used in interior home applications, such as flooring and cabinetry. Use red oak for cabinets if you want a rich wood that is durable and easy to stain. Because red oak is a porous wood, it is able to take stain evenly and without blotching. 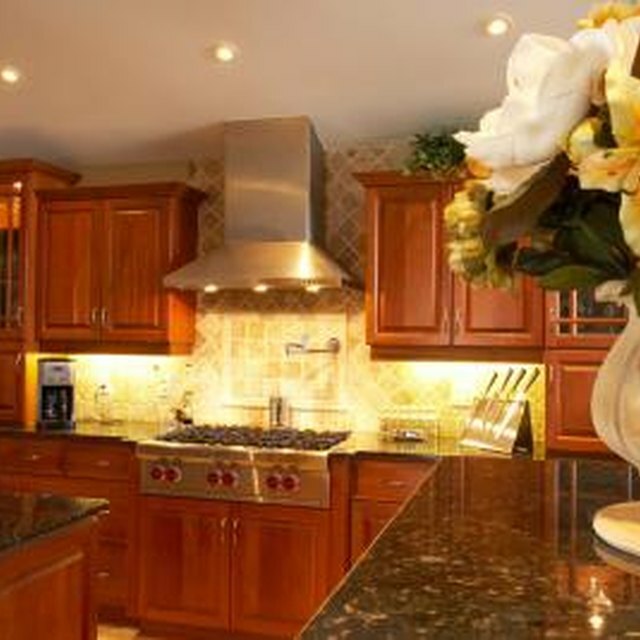 There are many tones of wood stain available for staining red oak cabinets. Gold, red or brown stains can be used, giving you the ability to choose a tone that will best complement your bathroom or kitchen. Remove the doors and drawers before staining the cabinets. Sand the cabinets, doors and drawer faces with 120-grit sandpaper until you achieve a smooth surface, using an electric sander for consistent coverage. Change the sandpaper to 220-grit and finishing smoothing the cabinet surfaces. Wipe away and sweep up the residual wood dust. Clean and rub down all surfaces to be stained with a rage. Moisten the rag with water with if you are using a water-based stain; use denatured alcohol if you are using an oil-based stain. Apply a coat of wood conditioner to the wood with a paintbrush to ensure even stain coverage as well as a lustrous finish. Apply water-based conditioner if you're using water-based stain, or an oil-based conditioner for oil-based stain. Work in the same direction that the wood grain runs. Allow the conditioner to soak into the wood for 10 minutes. Wipe away any excess with a clean, cotton cloth. Allow the conditioner to dry for two hours. Apply a even coat of stain with a clean cotton cloth or a paintbrush. Rub the stain onto the wood in the same direction as the wood grain. Allow the stain to sit on the cabinetry for about 20 minutes. Wipe away the excess stain with a clean, cotton cloth. Let the stain dry for four hours. Apply a second coat of stain if needed to even out or darken the color. Allow the final coat to dry for at least 24 hours, until it's completely dry. Apply a protective wood finish or varnish to the cabinet surfaces -- water-based finish for a water-based stain and oil-based finish for an oil-based stain. Paint on an even coat of finish, working in the same direction as the wood grain. Allow the finish to dry for at least four hours. Sand the wood surfaces with 220-grit sandpaper and wipe away the sanding dust. Apply subsequent coats until the desired luster is achieved. Let each coat dry, then sand it, before applying the next. Let the finish dry according to the manufacturer's directions before putting the cabinets back together or using them. Always work in a well-ventilated area or wear a face mask when working with vaporous stains and finishes.